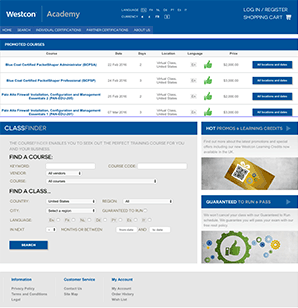 Westcon Academy offers a complete portfolio of sales, presales, certification and technical training courses to provide hands-on experience with the latest Check Point Software Technologies products and solutions. As an Authorized Training Center (ATC) for Check Point Software Technologies, we can tailor learning to your specific business plan and audience. Our solutions can also be customized for your local, regional and global needs, and you can resell approved courses at great margins. Training offerings include classroom, virtual, remote and online self-paced learning. CCSA. The Check Point Security Administration training course gives participants an understanding of the basic concepts and skills necessary to configure Check Point Security Gateway and Management Software Blades. CCSE. The advanced course teaches how to build, modify, deploy and troubleshoot Check Point Security Systems on the GAiA operating system. Hands-on lab exercises teach how to debug firewall processes, optimize VPN performance and upgrade Management Servers. Visit our Learning Management System for more information and to register.